DRIVEN PULLEY FOR JONSERED (PART: 531 00 16-99), JH125/JH129 IRON HORSE (Lennartsfors). 17mm Bore, 6" Dia. 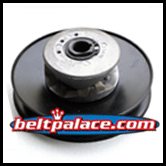 DRIVEN PULLEY FOR JONSERED (531 00 16-99), JH125/JH129 IRON HORSE. 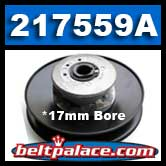 Comet 217559A DRIVEN PULLEY FOR JONSERED (531 00 16-99), JH125/JH129 IRON HORSE (Lennartsfors). 17mm Bore, 6" Dia. Comet Industries 217559A Driven Clutch for Iron Horse forestry and big game hunting skidder/hauler. Compatible with Comet 20 Series CVT belts and Drive Clutch. LIMITED PRODUCTION. NOW IN STOCK! JONSERED 531 00 16-99 DRIVEN PULLEY FOR JH125 (1998-2008)/JH129 (2000-2008) IRON HORSE. 17mm Bore, Approx. 6" (155mm) Diameter. COMET 217559-A, 20 Series Driven unit, 17mm Bore.